A group of brown bears at Port Armstrong. The large subadult in the very center of the picture has been marked with a green paintball on its right side. The pair of cubs in the foreground have what's called a natal collar - the white fur around their necks that often (but not always) fades as they grow up. The one closest to the camera has also been marked with a green paintball. Photo by Phil Mooney. Tasering brown bears and shooting them with paintballs smacks of a goofy Alaska reality TV show, but it’s far from it. It’s part of a project that’s saving bears’ lives and keeping people safe. 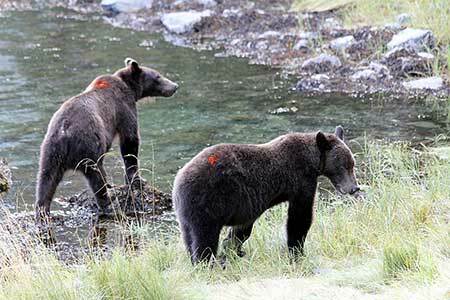 State Fish and Game biologist Phil Mooney and his colleagues have tazed more than 300 bears, and paintballed more than 100 at Port Armstrong, near Sitka, since 2010. They are teaching the animals to stay out of areas where they don’t belong — an option vastly preferable to killing them. Bears are also really sensitive to each other, to posturing, and to social status among bears, Mooney said. He and his colleagues apply their understanding of bear hierarchy, and what motivates and discourages them, to keep them out of trouble at Port Armstrong. 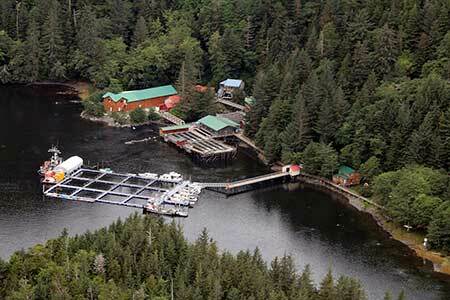 Port Armstrong is at the southern end of Baranof Island in Southeast Alaska, and the fish hatchery and adjacent salmon stream are powerful draws for brown bears. Manager Ben Contag once counted 36 individual bears in his two-minute walk to work. Bears out on the beach, in the creek below the weir and in the forest are fine, bears on the boardwalk and in the work areas are not. Over the years, hatchery staff have tried electric fences, whistles, seal bombs, cracker shells, pepper spray, a giant potato gun, yelling and screaming, and—as a rare last resort—shooting to kill under Defense of Life and Property rules. The hatchery produces more than 100 million salmon annually, mostly pink and chum. As a yearly glut of fish crowds the mouth of a short stream, scores of bears show up as this the largest accumulation of spawning fish available for miles. 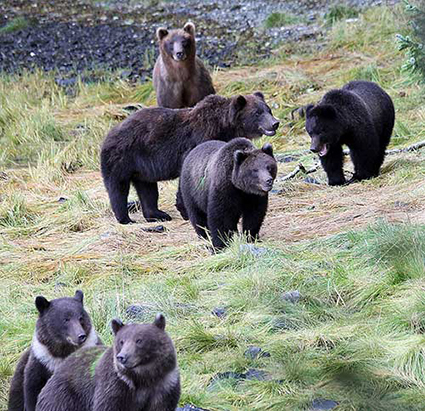 The bear numbers have grown over the years as generations of cubs raised on hatchery fish returned as adults, many with their own cubs in tow. Humans include a handful of seasonal workers and seven year-round staff. Though outnumbered by bears, they’ve built comfortable, albeit well-fortified, lives in trim homes lining the boardwalk. In the past, going nocturnal meant bears could sneak into the off-limits areas in the dark, but not anymore. The biologist can work in the dark using forward looking infrared devices, commonly called FLIR. Typically this is a camera, and the thermal imaging capability allows the user to see bears at night because they are warmer than the surroundings. A FLIR image of a person on the Port Armstrong boardwalk with a bear below in the beach. Infrared imagery registers contrasts in temperature. Photo by Phil Mooney. A big concern is not a deliberate mauling, but instead an accidental crash encounter. Bears pushing bears around might put a bear in an off-limits area by mistake, and there’s no point in hazing that animal. The biggest males tend to dominate, and they can demand respect. Mooney recalled one big male walking down the beach, and the other bears moved into the woods. If they didn’t, he’d start toward them, resuming his travel when they backed away. One bear near the water didn’t leave, and the big bear went after him. Turns out the second bear had no problem being chased into the water. Mostly, the bears are live-and-let live. But those expressions of dominance are important to the bears, Mooney said. Mooney and his ADF&G colleagues, primarily Larry Lewis and Neil Barten, use the bears’ sensitivity to hierarchy to their advantage. Tasers essentially make them the biggest bears on the beach. Approaching Port Armstrong by floatplane. The tide is high, and at low tide a rocky beach is exposed along the shoreline. The boardwalk can be seen paralleling the shoreline. The creek enters the cove just left of center, below the big brown building. Photo by Phil Mooney. Taser is a brand name for what’s technically called a conducted electrical weapon made by Taser International. The Taser fires a pair of small, dart-like probes that are connected back to the device with conductive wires. A nine-volt battery in the handle provides the power. Upon contact, an electrical current pulses between the two probes and disrupts the body’s voluntary control of muscles, causing what’s known as neuromuscular incapacitation (NMI). The current continues as long as the “on” switch is activated, for up to 60 seconds. For hazing, the typical jolt is usually three to five seconds. Tasers have been used to immobilize wildlife like bears, moose and deer for brief periods, 10 to 15 seconds, to free them from entanglements or administer an injection, but that’s not the case with hazing. They are just sending a message to the bears, Mooney said. They also yell at the bears, so they associate yelling with the experience. A pair of marked cubs. Three-year-old brown bears are pretty big, but their build gives away their youth. Their legs appear long, their necks and heads are thinner, and they haven't filled out and put on the weight that makes an adult more round and solid-looking. Photo by Phil Mooney. Shooting bears with paintballs serves two purposes. It enables the biologists and hatchery workers to identify individual bears, and it is a hazing action as well. The paintball “projector” can shoot a paintball 70 feet, but most shots are 15 to 30 feet, Mooney said. Marking is particularly important because of cubs’ personalities. While bears often have distinguishing markings — a natal collar or distinctive ear coloring — often bears are wet, the light is dim, and they are similar size. A three-year-old cub can be almost as big as an adult, although not as heavy. If the sow is killed, all the cubs will likely die without her. Mooney said in the past, sometimes the best option has been to take out that one problem cub, to save the sow and the other cubs, because that one cub will get them all killed. Bears are constantly in and out of the salt water, so biologists are using an oil based paint, which holds up well. Green, blue, orange, yellow and red are most visible. After about six weeks hair growth covers and shadows the color spot. The biologists and the folks at Port Armstrong have an arsenal of tools for dealing with bears that goes beyond Tasers and paintballs. Electric fences are pretty effective — but in some areas the tide comes up too high. In some cases they’ll string a single “hot” wire to protect an area at Port Armstrong. But electric fences have their limitations. The Taser can also deliver a shock. With the cartridge removed from the front, it can be used as a hand-held electrical arc generator. Mooney has simply shown the bears the arc and had them stop in their tracks, and even turn and run. He thinks bears have an inherent fear of electricity. It’s a bit mysterious, he admits, because lightning storms are extremely rare in Southeast Alaska. 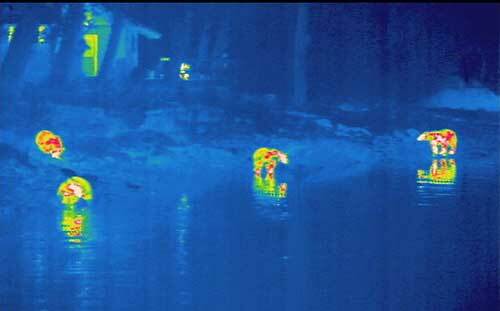 A FLIR image of bears in the dark at Port Armstrong. Photo by Phil Mooney. He thinks that’s also why they don’t like blue laser light. Bears are sensitive to sounds, and there are several commercial devices to repel deer, bears and wildlife, primarily from gardens. Mooney has found one design to be most effective. Because animals quickly learn that a noise is not harmful, the small, motion-triggered device uses a combination of different sounds and lights; high pitched sounds, people yelling and screaming, different colored lights, and it resets for a different pattern so animals don’t become accustomed to one pattern. The strobe lights, he said, are particularly effective. Then, there was the experiment with the potato bazooka. The Taser has proved to be the big stick that backs up the warnings. Mooney has seen things like the potato gun and rubber bullets fail, but not the Taser. Riley Woodford is the editor of Alaska Fish and Wildlife News and produces the Sounds Wild radio program.